Don't be surprised that you've never heard of Durham, Oregon. This gem of a community is a well-kept secret amongts residents - you'd never know that this tree-filled haven was nestled within the Tigard and Tualatin area, though it is located just west of Interstate 5 a few miles southwest of Portland. Though the official population comes in under 1500, the community is strong and focused on the preservation of Durham's gorgeous towering trees and lush natural areas. While the entire city of Durham takes up only 265 acres, over 50 acres are designated as parks or public greenspaces! Residents of Durham enjoy the natural beauty of the Fanno Creek and Tualatin flood planes, filled with forest and havens for animals and recreation. In fact, the City of Durham, Oregon has a strong and well-enforced Tree Ordinance, which requires permits for the removals of all trees greater than 5 inches in diameter as measured 2' above ground. While the city of Durham has no designated retail zones, residents have access to the wonderful restaurants, shopping, and neighborhood resources located along Upper Boones Ferry Road, the main thoroughfare through the city, and is located adjacent to the awesome, upscale Brudgeport Village shopping center. The opposite of your typical mall, Bridgeport Village is truly a shopper’s dream – outdoor setting, an insane variety of services – including valet parking, restaurant reservations, package carryout, and a courtesy shuttle to vehicles – gorgeous water fountains, an Italian gazebo, and gorgeous architecture. It’s a perfect place to spend an afternoon people-watching, grabbing a bite to eat at one of the gorgeous bistros, or just stroll along the cobblestone-paved paths and enjoy the air. That is, of course, when you’re not shopping! A Regal movie theater provides an escape from the sun or rain, and boasts an IMAX theater for an extra-special cinematic experience. You’ll get transported by the antique streetlamps, peaceful outdoor music, and gorgeous landscaping. If you love shopping, community, and trees as much as we do, you have to check out the city of Durham, Oregon! The City of Durham was named for Alonzo Durham, a flour and saw mill operator on Fanno Creek in the 1860's who also founded the nearby town of Lake Oswego. The historic mill site, located along the Boones Ferry Road to Portland, was originally known as Durhams Mills. In 1908, the Oregon Electric Railway established a stop called Durham at the location. Many of the huge, beautiful trees in the area were planted in the early 1900’s by the Pilkington Nursery, and the city was incorporated in 1966 by residents who were concerned that their residential and natural areas areas would become industrialized. The city of Durham has thrived since its incorporation, growing from a population of 410 in 1970 to the current official population of 1400. The City of Durham is less than a half square mile in size - around 265 acres - and is conveniently located only ½ mile west of Interstate 5. The City is completely surrounded by the larger Cities of Tigard and Tualatin and is also part of Washington County and the Portland Metropolitan area. The largest streets in Durham are SW Bridgeport Road, SW Upper Boones Ferry Road, and SW Tualatin Road. Children in the community attend the excellent schools of the Tigard-Tualatin School District, and Durham, Oregon residents have access to the Washington County library system at both the Tigard and Tualatin Libraries. Falling in love with the tree-filled Durham, Oregon area? Contact us for information about homes for sale in Durham and the Tigard/Tualatin area, including new construction, condos, historic homes, perfect picks for first-time home buyers, and one-of-a-kind luxury estates. The Durham area boasts some of the best schools and businesses in the Portland area, and the Portland Suburb real estate market is prime for a comeback! Durham City Park - This is where Fanno Creek empties into the Tualatin River. Durham City Park forms the eastern part of a relatively large open space which includes Tigard’s more developed Cook Park and Tualatin’s somewhat less developed Community Park. Right in the center of this park was once the Thomas Dairy. Clean Water Services recently acquired the dairy and is working with Metro and the City of Tigard to allocate this flooded field (formerly floodplain/wetland) into a picnic area, wetlands, and trails. It holds a lot of potential, particularly as the wetlands are restored. Hiking and Biking - Joggers, bikers, and hikers frequently access the city park areas through adjacent park land areas in the cities of Tualatin and Tigard. Health club, boating, tennis, swimming, skate park and golf facilities are available within one mile in the City of Tualatin. The Tualatin Crawfish Festival - In 1951 crawfish inhabited the Tualatin River in excess, and the First Annual Tualatin Crawfish Festival took place, now one of the most important events in the city. Area organizations and many government officials take part. The festival offers a wide variety of food, entertainment and activities for all ages such as a parade, dog show, live music, craft vendors, and crawfish of course. It’s estimated that 12,000 people attend annually, making Tualatin a rival for some of the Louisiana cities’ crawfish festivals. Tualatin Country Club - Membership at the Tualatin Country Club provides you and your family the opportunity to enjoy all of the amenities and unlimited golf at one of the great traditional golf facilities in the Northwest. The club chooses to maintain a limited number of members in order to maintain an enjoyable level of availability on the golf course. Four sets of tees accommodate golfers of all abilities. The course has a total yardage just over 6,700 yards and a par 72. The Tualatin Country Club is proud to be certified by the Audobon International Sanctuary Program, which helps golf courses protect our environment and preserve the natural heritage of the game of golf. Bridgeport Village - Bridgeport Village is home to some of the best shopping in the state, with stores like the only Crate & Barrel and Z Gallerie located between San Francisco and Seattle and the first The Container Store located north of San Francisco. Other stores made their Oregon debut at Bridgeport Village like Tommy Bahama, and Shoefly. But it’s not just about the shopping. There’s great eateries like P.F. Chang’s, Romano’s Macaroni Grill, and the only McCormick & Schmick’s Grill in Oregon. There’s also the Regal Cinemas Bridgeport Village Stadium 18 & IMAX Theater, complete with stadium seating and the latest digital surround sound for an optimal viewing experience. Other stores and restaurants include Anthropologie, BCBG MAXAZRIA, Coldwater Creek, Tutto Bene Italian Café & Gelato Bar and Sinju Japanese Restaurant, which was named the best Japanese restaurant in Portland by Portland Monthly magazine. Lee Farms - Lee Farms is a sixth generation run berry patch, pumpkin patch, and Christmas tree farm. Their country store features jams and jellies from fresh berries, a bakery and more. The fields are open to u-pickers in June, but their busy season is October when they create a giant pumpkin patch from their 20-acre stock. They also open a hay maze, a farm animal display/petting zoo and weekend hay and pony rides. Make an afternoon out of enjoying the farm's rural setting so close to urban Portland. Durham neighbor's Tualatin Parks & Artwalk - With more than 200 acres of parks, green spaces and greenways, there are plenty of recreation opportunities in Tualatin. 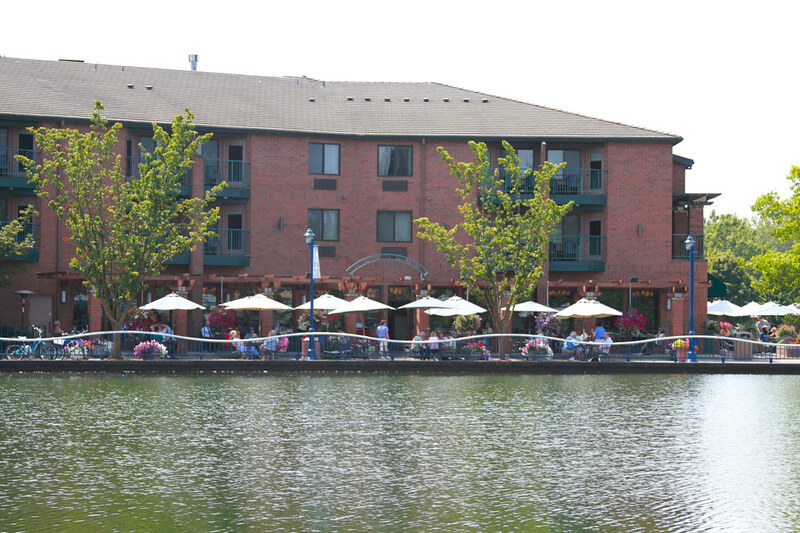 Tualatin Commons is a 19 acre park in the center of downtown including an interactive fountain, a pedestrian promenade around a three acre lake and public plazas. The Concerts on the Commons are held here in the summer. Community Park along the Tualatin River is the city's largest park, and boasts of an award winning skate park for skateboarders and inline skaters that occupies a 12,000 square foot area. The Tualatin Artwalk is a self guided tour of the cities public art by four loops with interconnected trails, and varying distances up to one mile. The cities public art ranges from sculptures to murals to a mastodon skeleton. With map kiosks and interpretive signs, it’s a fun and informative way to see public art. Mashita Teriyaki - 18810 SW Boones Ferry Rd - Mashita's is fantastic! Great food, low prices, generous portions, and quick friendly service. The daily lunch special is a deal at $4.99, which includes a drink! The chicken is fresh off the grill and marinated to perfection. It's served with a heap of rice and steamed vegetables, and they don't skimp on volume. For many people, you'll get a dinner out of your leftovers! Gubanc's Pub - 16008 Boones Ferry Rd - Great food at great prices, nice laidback atmosphere. The menu is traditional comfort food, but made from scratch with local ingredients and healthy touches. You've got to try their signature mushroom soup, though the burger truly is amazing and so are the sandwiches. The cozy decor is Northwest Modern, with lots of wood, even in the lampshades! Riccardo's Ristorante - 16035 Boones Ferry Rd - The first thing you notice once seated at Riccardo's is the big binder you are given that serves as the wine list. It is very through and they do stock a vast array of wines for even the most demanding wine connoisseur. The menu is very concise, featuring entrees that are freshly made and seasonal. You'll feel whisked away to Italy for the night, especially if you sit in their heated outdoor patio with fountains bubbling away.